That's not the only thing that distinguishes this level set as a whole. You'll chance across many encounters where YOU get the drop on the monster, something I haven't seen much of if at all in Doom PWADs. Maples is also fond of some fairly gratuitous backtracking. In several instances you'll have to return to the very beginning of the map – quite a trek – or run through the same maze several times with little opposition to make subsequent journeys thrilling. To his credit, in a few cases he lays down measures that allow you to skip some of the duller parts, but in general you'll get to know these hallways quite well. What sets this WAD apart from others in particular is a batch of new graphics and sounds that give the levels a...unique aesthetic. Dark green marble and bright orange metal make their debuts in this mapset, among other things. 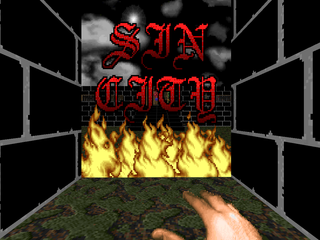 There are also some new false wall graphics, like the satanic spider's web or the burning Sin City banner that serves as a starting gate for most, if not all, his maps. Sounds are a curious mix of wholly new material and stranger decisions. Astute players will notice that many of the monster noises have been reversed, giving them an alien yet familiar quality. I kind of wish he'd included the reversed Icon of Sin message as a joke. The WAD isn't particularly difficult to clear, excepting perhaps a scenario Maples intended to be untenable ("If you can get 100% kills on this level in Ultra Violence you cheated"), and a number of secrets containing must-have weaponry like rocket launchers and plasma rifles. Levels 06-09 are I think worth a play, but I recommend that persnickety users avoid this mapset. For a series of works that claim to draw inspiration from AC/DC, they're done dirt cheap. Small but dense fortress-style level that showcases a lot of the new graphics and sounds. Except for the few beasts around the castle exterior, it's a claustrophobic affair, with a lot of the map devoted to some maze-like corridors. The fights are more or less okay, with a pair of arch-viles outside the yellow door room (though you should be well-equipped to handle them). While most of the new visuals aren't obnoxious, there's one particular eyesore, a bright orange techwall room with SS Troopers dotting the columns raising out of the water. A bizarre dungeon map with plenty of walkthru walls and secret crannies. In fact, the yellow key is quite visibly located within a secret. Otherwise, you're presented with two options. Everything to your right is optional, but if you don't want to fall prey to an arch-vile ghost machine, you should go right to pick up the rocket launcher (in a secret, no less). 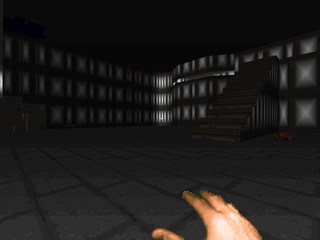 The left route has the meat of the map, including the aforementioned ghost generator, but nothing too dangerous except for the final encounter. Easy to just speed through, but if you want to finish it out, you'll have to make a gutsy invulnerability grab or just dodge rockets until you get some decent cover. Basically another subterranean slog much like MAP02. Long, bizarrely colored hallways and mostly fair to middling action. The plasma rifle, essential equipment for a complete run, is locked behind a hidden yellow key, whose door trigger occurs sometime after passing the door in question. Some awful texture errors, especially in the rocket launcher room. 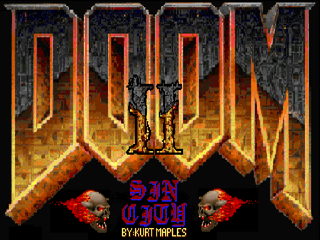 The climax is a huge battle that occurs over the Doom logo, with about eight Cyberdemons and thirty pain elementals teleporting in, among other things, when you step onto the exit platform. If you want a full kill tally, be prepared for a lot of tedious infighting and make sure to plan your ammo pickups. A bit of an improvement over the previous three maps. Some attention to lighting and less proliferation of bizarre textures. 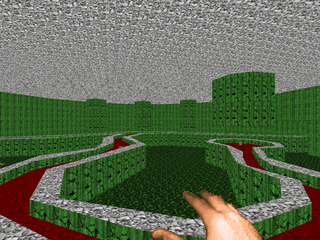 It's still a stark contrast between long corridors, mazes, and empty, wide-open spaces. One particularly nice bit Maples puts in allows you to circumvent the crate gauntlet near the beginning of the level, with the relevant areas also serving to release some more monsters at the player. The downside is, after you've grabbed the red key, you have to walk through the entire level again to get to the exit door. I do like the Cyberdemon shelf, though. A rectangular level featuring a large, rectangular fortress. The outside is kind of neat with a nukage channel in the northeast but the rest of it is bland bland bland. When you get inside it's basically the same mazey, corridor gameplay from previous maps, except this time with plenty of stairs to kind of vary things up. Biggest pet peeves... All the secrets are wallhumping secrets. One of them is locked off if you hit an important switch in the room. 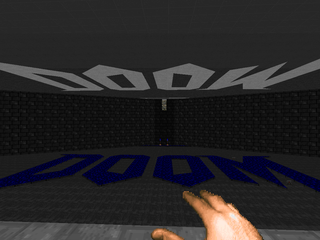 Also, I have no idea what is up with that demon / crusher room. Standout encounter would be the final room, which is okay and tosses some barons at you. Also, the room immediately after escaping the dark gray maze does a good job of sneaking some spectres in on you. Some steps forward and some steps backward. 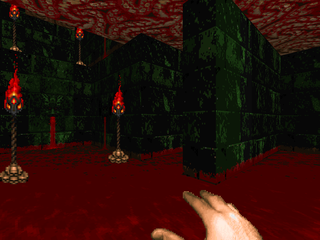 While Maples falls back on his tried and tepid mazes for a lot of this map, to his credit, he manages to nail it in the opening sequence, a pit of blood-soaked dark green stone whose crannies you can either explore or bypass by simply hitting the switch that raises you to the next level. 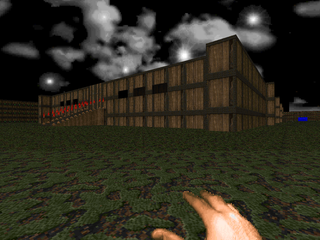 You exit into a neat arena, which annoyingly features two Cyberdemons behind false walls that take some time to bring down, given that you can't actually see where they are, only where the rockets are coming from at any given moment. The rest is, well, mazey, though there's a decent underground cavern. Also confusing: the exit switch is located back in the blood pit, which you already had to go back to once for the red key. And a few deathtraps, including a secret that, if you linger, will trap you forever. Even better! 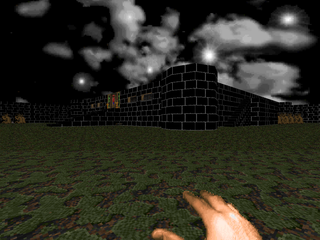 This map's star attraction is a large outer yard in which some battlements have been placed, with a small watchtower loaded with munitions and then a larger, castle-like structure. The fighting is okay but you'll be hitscanned-sniped to Hell, including a false wall concealing a row of the buggers. After crossing a neat bridge, Maples drops you in another maze-ish area, but the fights are more interesting, including a nasty ambush as well as an arch-vile battle, and it's much shorter. Standout encounter: a cacodemon secret ambush you are hilariously over-prepared for. I guess the giant blood pyramid is okay, too, but it's quite anticlimactic. A strange but interesting romp set mostly in a light green stone cavern with blood channels raised above some spectre-laced nukage. The very opening occurs above ground and features a small, derelict building with some up-close fighting, but nothing spectacular. 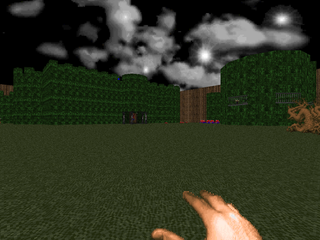 The rest of the map is, you guessed it, a length of corridors linking the two segments together. While they're not thrilling, the blood channel makes up for it. 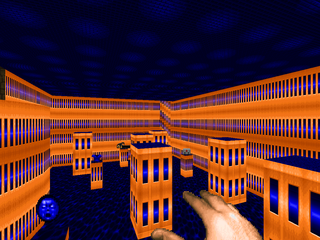 Standout encounter is probably a cacodemon blitz similar to the secret in MAP07, as well as a tricky Cyberdemon fight. The final map in the Sin City episode is, appropriately enough, Sin City. 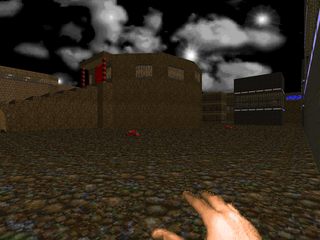 A medium-size "Downtown"-style map, it features some of the more interesting layouts Maples has to offer, including some enemy columns. 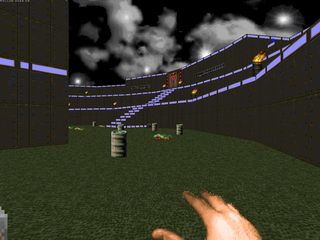 One of the neater buildings has a gauntlet through several raised gates that's necessary in order to access a rocket launcher, and has a tricky trap, especially if you didn't grab the plasma rifle, located elsewhere. Fights aren't that memorable except for a token Cyberdemon fight which sticks out among otherwise tepid action. Standout moment: the hanging corpse crusher stashed away in a secret area in the northeast. 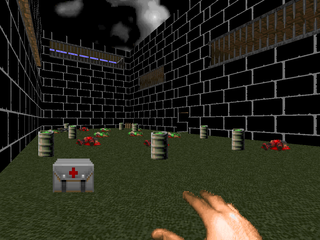 For one of the earlier maps created for Doom, this one blew it out of the park. I remember it from the mid 90s and recently gave it another go. Really stands the test of time.